Black color looks gorgeous, royal, and impressive. When it comes to buying slabs and tiles to paint a commercial or domestic space with a very consistent color and texture, Absolute Black granite catches all eyes. Natural stone experts recommend this stone for internal and external uses suited to your individual interest. This stone is the first choice of rich people for crafting beautiful granite countertops, outdoor cladding, floors, and architectural features. Available in all popular sizes, Absolute Black granite slab delivers a new meaning to the presentation of countertops, vanity tops, steps and risers, basins, and other interior products. Granite is a strong, functional, and beautiful stone. The long-lasting feature of the stone makes it a unanimous choice for garnering any individual space. Absolute Black Granite is known by different names in the natural stone industry, such as Jet black, Nero black, Nero absolute, telephone black, Indian super black, chamrajnagar black, Belfast black, Khammam black, Nero Zimbabwe, Shanxi black, z black granite, and hosure black granite. Applications – Good for residential and commercial uses in walls, countertops, flooring, monuments, countertops, mosaic, fountains, wall capping, stairs, window sills, and pool, this stone is ideal for exterior usage. Absolute Black granite also works well in freezing climate. Chemical composition by weight percentage: MgO-0.71%; FeO-1.68%; Na2O-3.69%; Al2O3-14.42% (alumina); CaO-1.82%; Fe2O3-1.22%; K2O-4.12%; MnO-0.05%; P2O5-0.12%; SiO2-72.04% (silica), and TiO2-0.30%. Absolute black granite slab (gangsaw): 260 x 160 cm up in 2 & 3 cm. Absolute black granite slab (cutter): 180 x 60 cm up in 2 & 3 cm. Absolute Black granite tiles: In all popular sizes. Open porosity: 4 % vol. Water absorption: 0.02 – 0.06 % wt. Abrasion resistance of Absolute Black granite shows its potential to resist surface wear. On the Mohs scale, the black stone is rated as a 3.5-6.5. The high scratching resistance of this stone over other stones with a low abrasion resistance rating that makes it completely useful for flooring and countertop options. Absorption of Absolute Black granite is known as the relative porosity of a material. In terms of absorption ability, this stone shows low to moderate absorption rate. That is why you need to seal this material properly prior to use. To keep this stone look new, you have to wipe up spills from the surface at once. Remember that the stone is vulnerable to highly-pigmented liquids and oils. The acid sensitivity of Absolute Black granite is the probability of a stone material reacting to acidic liquids and foods. As far as this stone is concerned, black granite is concerned it is minimally responsive to acids. Moreover, the stone doesn’t lose surface shine and acid etch on being exposed to acidic liquids. 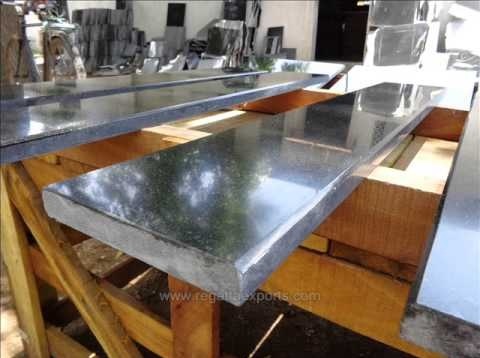 Regatta Granites India, one of the popular Indian Absolute Black granite suppliers, manufacturers, and exporters, delivers high-quality granite stone globally in different finishes, sizes, and patterns at competitive prices. Please subscribe our news letter.